The Sassi and the park of the Rupestrian Churches of Matera are the best surviving and most complete examples of rock-cut settlement in the Mediterranean region. They have been developed in close harmony with the natural environments. Nature has provided this location with a belt of soft tufa, with two natural depressions. The caves here have been used since prehistoric times. 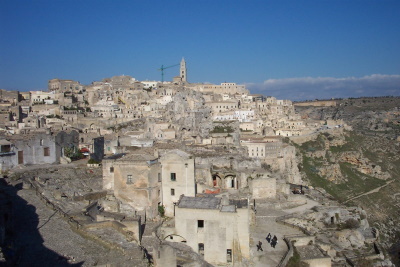 Population pressure drove people out of the city of Matera, into these Sassi. From the 17th century on, this area was left to the poor. At first they lived in the bare caves, later these developed into house-like structures. The Sassi were evacuated by law in 1952. 15.000 people, living in extremely poor hygienic circumstances, had to be resettled to new quarters. I had read "Christ stopped at Eboli" by Carlo Levi in preparation of this trip. This classic describes the poor living standards and the neglect of the people in Basilicata, during the author's exile to the area in the 1930s. 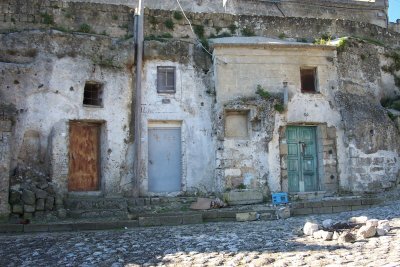 There's only a short passage specifically about the Sassi in Matera. However, it indicates that the conditions there were even worse than in the surrounding countryside. What to expect in the year 2005? I had prepared myself for some gloomy rocks, with small passages between them. But it's quite different from that: the Sassi overlook an impressive canyon, and a wide panoramic road encircles the quarters. In one of the houses you can also have a look inside. It doesn't look too bad on first sight - but you have to bear in mind that this one is now cleaned every day, the horse standing in the corner is not a live one and sharing the room with 18 family members is quite crowded. Besides poverty, malaria was also a big problem for the inhabitants. Matera will be the European Capital of Culture in 2019, a title that has previously been held by that other World Heritage Site, Liverpool – although the two could hardly be more different. My visit was in August 2015, after a pretty unexciting trip to Castel del Monte. Matera was by contrast a refreshingly interesting WHS. Nowadays tourists can stay in converted Sassi and others are shops or restaurants, but most stand empty, making the district quite eery when you find yourself in a quiet area. There are numerous small churches and preserved dwellings you can go in to, but they all charge a separate entry fee – so visiting them all would be costly. We found the rock-hewn Church of the Madonna delle Virtù and its connected monastery particularly worth visiting, as well as the church of Santa Maria de Idris in the Monterrone outcrop. We also enjoyed a large platter of typical Basilicata food (all kinds of vegetables and cheeses). Water was not in short supply on the day we visited – at least, not in the vicinity. As you can see behind me, there was an ominously grey sky, which – although it didn’t rain on Matera – shot out thunderbolts in a manner that made it feel pretty Biblical. I visited this WHS in June 2014. I spent 2 days here and I got to visit both main Sassi areas (Sasso Caveoso has more to offer) as well as a number of Rupestrian Churches and cave homes. The best views of the Sassi and Matera in general are the Belvedere just opposite (some 6km away by car) and the view from the Convicinio di Sant'Antonio. The combined ticket that gives you access to all the Rupestrian Churches costs 7 euros and all are definitely worth a visit. However, my personal highlight was the Santa Lucia alle Malve with its beautiful frescoes and engravings. Flash photography is strictly not allowed and when there are several groups no photos are allowed to avoid waiting times. The caves opposite Matera (near the Belvedere) are worth a hike mostly for birdwatching (mostly swifts and lesser kestrels) and to enjoy the flora and different butterfly species. However, some of them are painted with frescoes and the best one is Madonna delle Tre Porte (marked 102 in the orange hiking trail). 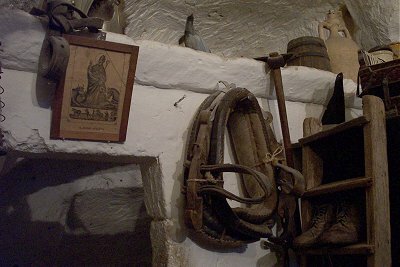 There are a couple of cave homes that you can visit to try to imagine what it must have been like to live in such conditions. I discovered Matera when researching "things to Do" from one of my upcoming cruise ports, Bari, Italy. I fell in love with the photos and the stories about this area and also the unique town of Alberobello nearby. Indeed, this was my favorite stop of 12 on a fabulous cruise from Venice to Rome, and one of my favorite stops in Italy, which is my favorite country so far out of almost 60 I have visited. I contracted with "Tours of Pugilia" to meet us at our ship for a full, informative day with lots of walking. The guide knew everything from exported products to history from thousands of years. The broken AC on the bus and attitude of the bus driver was not as excellent. The tour price seemed a bit high, around 70 euro per person with a dozen people, but the tour was worth it. Arriving at Matera early before any other tourists was just magical. We enjoyed the tour of the Sassi cave home museum and bought a local fertility whistle for a prewedding gift for our son. A local man serenaded us with his singing to his accordian music and although Matera seemed mostly deserted, the feel of history and the impression of time standing still was palpable in this inspiring setting. I wish we had time to dine or stay the night in Matera, but the memory of visiting this unique, magical place will remain one of my top travel experiences. The first time i visited Matera was in the year 1975, I was part of a group of youngsters from the island of Malta and we had come to Matera as a part of a work camp. We stayed in Matera for 3 weeks, it was an amazing experienc, In those days few people lived in i Sassi as many people had left to live in upper Matera where the houses were more modern. I visited Matera again in 1988 and i could notice that a great improvement had been done to the Sassi, I am planning a visit to Matera and would really love to stay in a cave hotel,I am looking foward to seeing Matera again after all these years! The sassi of Matera are one of the major tourist attractions of southern Italy, and much has been written about the houses and the poor quality of life of the people who lived there. Much more amazing in my opinion are the stunning location and the beautiful views one can enjoy from several places in and around Matera. The place has been inhabited since the Stone Age, and you can definitely feel the history of the place when you stand above the huge canyon and see the houses and churches hewn into the rock. No wonder Mel Gibson came here to film The Passion of the Christ. 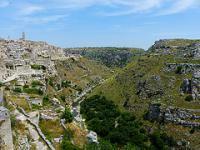 I visited I Sassi di Matera in the summer of 2001. What words can I possibly use to describe it? Breath-taking, remarkable, awe-inspiring. I felt as if I stepped back into time hundreds or even thousands of years. It's the type of place where you feel the presence of history under your feet. As I walked in and around the stone houses and beautiful churches it was not very difficult for me to imagine how this rich culture lived. The stone streets and simple white houses allowed me to take that spiritual trip back into time. I felt as if at any moment, a Roman soldier or peasant woman would come around the corner. It's that kind of place. I walked in with an appreciation of my Italian heritage....and I walked out with a strong, deep-rooted love for it. 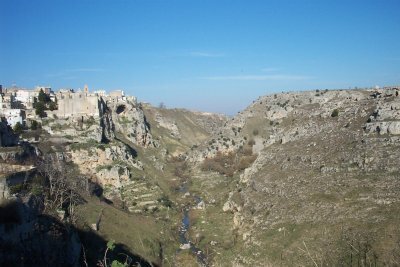 From "I Sassi di Matera" to "The Sassi and the park of the Rupestrian Churches of Matera"